A new era of entertainment is about dawn in Dubai with ‘La Perle’, a new show produced and created by Dragone, one of the world’s most revered cultural artistic producers. Located in the heart of Al Habtoor City, ‘La Perle’ will be the region’s first permanent show, boasting 450 performances per year in a tailor-made, state-of-the-art aqua-theatre. ‘La Perle’, produced by cultural-creative company, Dragone, directed by the legendary artistic director, Franco Dragone, and brought to Dubai by the Al Habtoor Group, will be created in Dubai and embody the spirit of Arabia. The production credentials for ‘La Perle’ are first class, starting with Franco Dragone, one of the most sought-after artistic directors in the world. Famed for reinventing the genre of theatre and changing the face of live entertainment in Las Vegas, Dragone’s most significant shows in the last decade include ‘Celine Dion – A New Day’, ‘Le Rêve’ (Las Vegas) and ‘The House of Dancing Water’ (Macau). ‘La Perle’ will feature a cast of 65 premier artists performing breath-taking aqua and aerial feats with the assistance of 70 specialised technicians in the innovative and intimate 1,300 seat theatre. 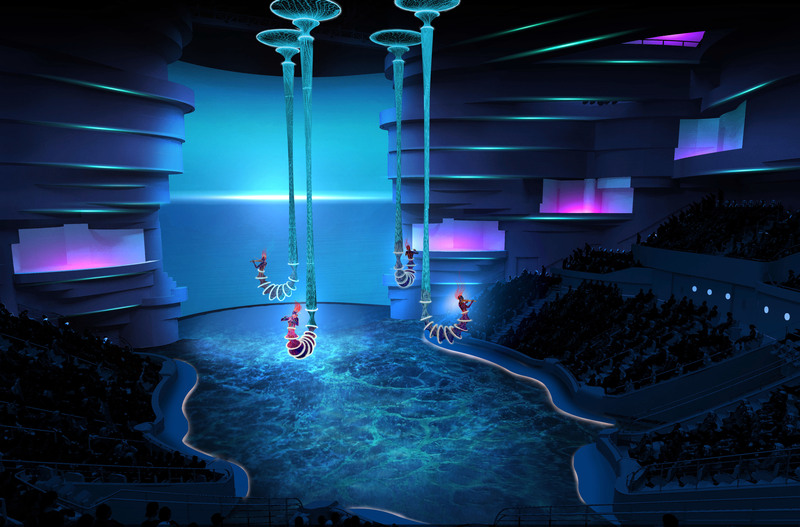 The theatre itself will feature an ‘aqua-stage’, filled with 2.7 million litres of water and will have the ability to change from a dry platform to aquatic stage and vice versa. Daredevil performers will dive into the water-filled stage from a height of 25 m and fly around the auditorium on high-powered winches at a speed of 15 km/h. Combining cutting-edge stagecraft and progressive technology, ‘La Perle’ will be a visually stunning spectacle in, on and above water. The name ‘La Perle’ reflects the high calibre and elegance of each performer in the show, who have distinguished themselves from other artists around the world and have become treasures in the creation of this masterpiece. “One of the best thing about our show is that there is a story which is written in Dubai, for Dubai, with the real essence of Arabia, but, there is no language. So, people from any part of the world can understand the story when they come to see it. India is the main source market that we are looking at. The theatre is expected to open in August this year and we are working very closely with all the big theatre companies, tour operators and DMCs in India and the UAE,” added Archith Nair, Director, Travel Trade, ‘La Perle’. ‘La Perle’ will be an unmissable visitor experience and an iconic show for Dubai, offering an unmatched immersive production that can only be delivered in a purpose-built theatre. London, New York, Las Vegas and Macau all have iconic shows that attract millions of visitors a year. In 2015, 65 pc of the 41 million visitors to Las Vegas bought tickets to see resident shows. In Dubai, visitors stay, on an average, for about four days, during which they enjoy an array of daytime activities from souks to shopping, desert adventures to theme parks and incredible beaches. The evening show will perfectly complement Dubai’s superlative tourism offerings and when the sun goes down, ‘La Perle’ will shine. Group and MICE bookings are being accepted with individual tickets going on sale to the general public in mid-2017.